Since becoming a runner three years ago I have continually heard about the Solstice Run in Northville, MI. It is an annual 10 mile race which always sells out and from everything I have heard is an amazing route to run. For many of you out there this chart wouldn’t phase you. For me it was a slight moment of panic and nervous reaction. Living in Mason we have quite a few nice hills to practice running on, and Mark and I always try to work them into our training routes so we are no strangers to running hills. However, running eight to nine straight miles of hills was going to be a challenge. I knew instantly this was going to be a challenging race for both of us; however, I knew we could do it! Both of us love to challenge ourselves and have the ability to mentally and physically push our bodies to reach the goals we’ve set. Knowing that both Mark and I run the best when we totally pig out the day before on a protein heavy meal I immediately began to plan dinner for Friday night. On the menu – bacon, shrimp, baked cod, white rice and ice cream. Saturday morning finally arrived with our alarm clock going off at 4:45 am. (That’s the one drag about race morning is how early you always have to get up!) We finished packing our race bag, quickly ate our breakfast, and headed out the door a few minutes later than we had intended to. At 6:00 am we arrived at my parents house, filled up our water bottles and quickly headed out towards Northville. 30 minutes later we arrived in Northville, parked the car and walked down to Northville Down Race Track where the start of the race would take place. The starting gate in the middle of the track! We took a few minutes to hit the bathrooms and stretch before we all went to watch the start of the 10k race, which began 20 minutes before our race. Then finally… it was time! 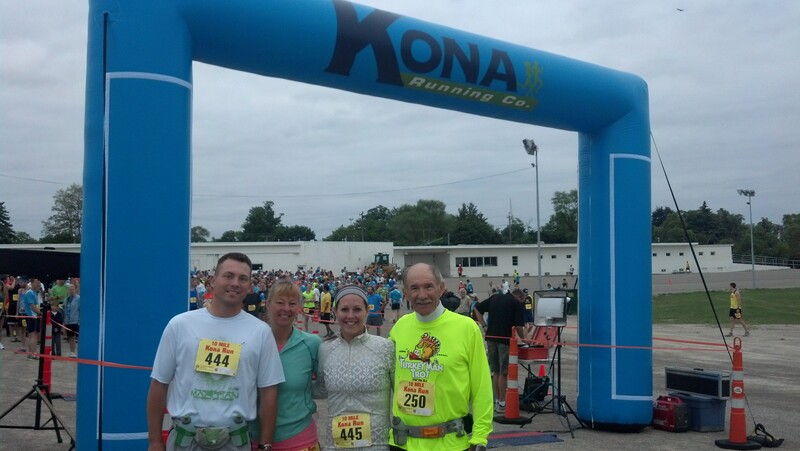 Mark, Mom, myself and Dad at the starting gate for the Kona 10 Mile Run! We ran the first 1/2 mile of the race around the race track (I really enjoyed that, seeing I grew up on a horse farm) before heading out on a beautiful route through Northville. Right after leaving the horse track we were greeted by the first (of many) hills on the course. Mark and I tucked our heads and up the hill we went, seeing the 1 mile marker as we crested the top of the hill and Mark called out that we had ran the first mile in 10:45. Our goal was to do 10:30 miles, so doing a 10:45 with the massive hill we had just ran I knew we were right on pace. Miles 2-6 went by without a hitch — and we average between 10:15 and 10:22 miles all while constantly running either up or down hill. (Trust me, I like downhills much better than up hills, lol!) Then came mile 7 — mile 7 was mentally and physically challenging for me. I could tell that we were moving at quite a good pace and I forced myself to push on. Once we hit the 8 mile marker Mark called out that we ran the 7th mile in 9:45. “Holy Crap” is exactly what was going through my mind! A half mile into 7th mile the course looped around the block and we saw my Dad who was 1/2-1 mile ahead of us — giving each other high-fives as we passed. 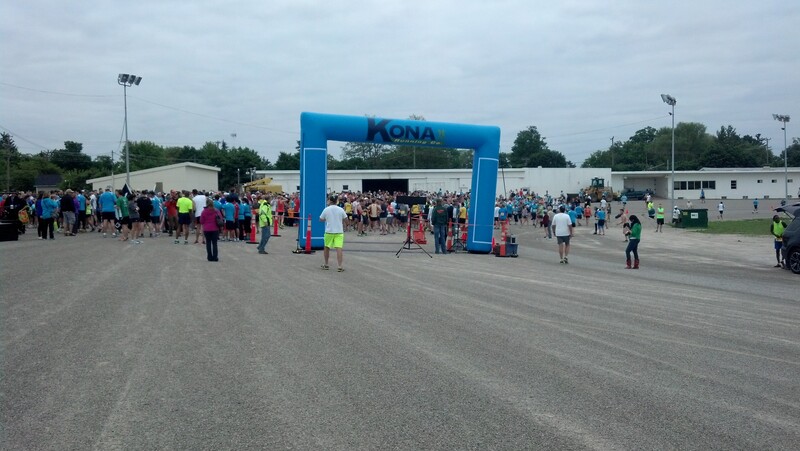 A little after the 8 mile marker the courses all merged together — the 10 mile, 10k and 5k courses. Mark and I laughed with a few of the 5k runners (they were only 1.25 miles into their race) about how energetic they all looked compared to us 10 mile runners. There were a lot more 10k and 5k runners than 10 mile runners, so the course got pretty crowded at this point. Eventually we ran down and around into Ford Park with only 200 yards remaining to the finish line — and here is where I got pretty disappointed. The path to the finish line was just a little trail about 3 to 4 feet wide. The finish shoot was incredibly narrow and there was no more than 5 to 10 feet of space after the timing mats for runners to slow and stop before they would run into a crowd of people. Because there was over 1,000 runners trying to finish both Mark and I had a hard time finishing our best — and both of us almost plowed into the large group people standing so closely behind the finish gate. We grabbed our medals; however, there were so many people and there was no order to anything it took us 15 minutes to find the water/banana/bagel station. After we both grabbed some water and a bagel we took off to find my Mom and Dad who finished shortly before we did. Myself, Mom, Mark and Dad after finishing the Kona 10 Mile Race! 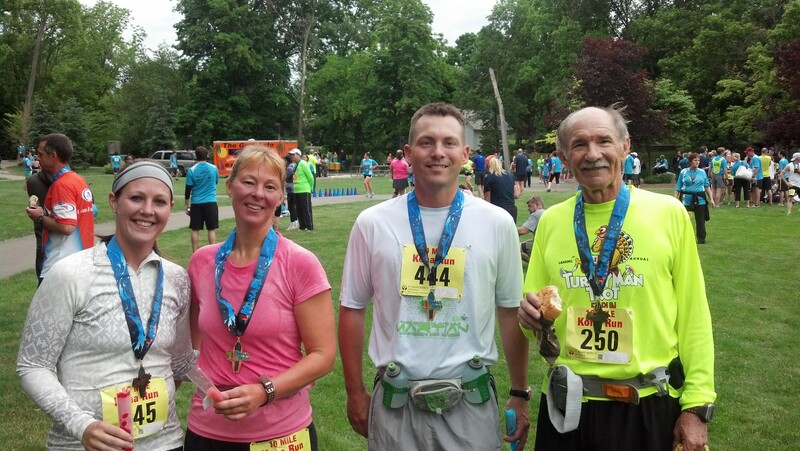 I am so proud of our finish time – 1:42:45 which equates out to 10:17 miles! That’s 13 seconds per mile faster than our goal pace! 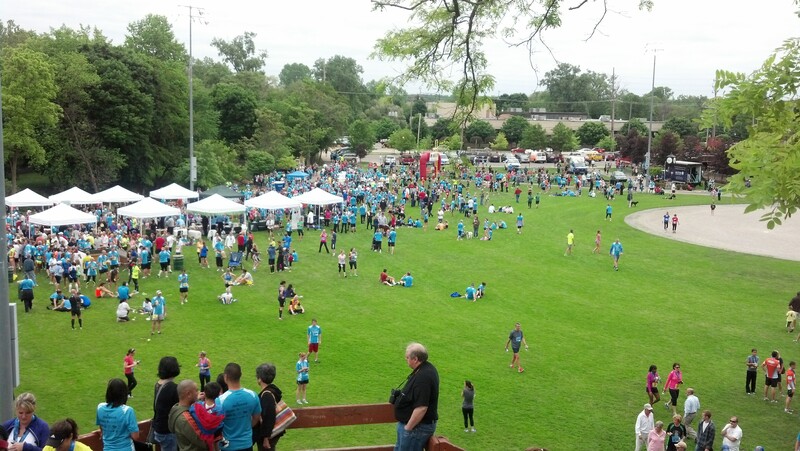 The finish area in Ford Park (Northville, MI). The entire course was so beautiful and a race we will keep in mind for future years. Mark and I cannot wait until October when we run the Wicked Halloween 10k in Plymouth, completing the Triple Crown and getting our extra medal!